Her book can be read as a study of what an introvert is and how they function, but Cain’s thesis is exceedingly more precise. As implied by the title, she goes about evaluating how culture – especially American culture – more readily accepts the extrovert ideal over the introvert’s offerings. Delving into examples from business, education, invention, sales, religion, and the creative arts, her book is like one of those pictures where you see a complete image, but upon closer inspection you see it is made up of smaller pictures. In order to create the large picture of societal introversion, she pieces together many different examples and stories. Challis’ brief quote makes it clear his ‘faith’ is based on who he is and not so much on who Jesus is. Jesus calls His disciples to follow in His Way. It is not about oneself. Until 125 years ago the’ individualism’ so infecting modern day Christianity did not exist. “You could look it up!”, as Yogi says. Some have discovered recently and are saying that what Jesus said and did was to invite people to be His disciples and follow His Way, as it was called in the 1st century. Read the NT text to find this thought time and time again. The only calling Jesus does it to be His disciple. Jim, I absolutely agree with you about the ways individualism has overtaken Christianity, and from the little I know of Challies’ work, your comment is right on the mark. HOWEVER, I wonderful if the gist of his idea here — that there is a temptation for introverts to avoid relational situations that challenging for them — holds true whether one understands the faith as acted out by autonomous individuals or by members of a body. Correct you are, Chris and I agree right back. Challis’ point/your point is the challenge for introverts; at least the most neurotic ones. There exists a huge number of ‘us’ who are well-adjusted introverts, otherwise. Without hiding behind the ‘God told me so’ defense, the intros, as well as the extros, were built by God and have the imbedded Breath; which makes them both viable disciples, but for the debilitating, run amok individualism. An excellent socio-historical presentation on NT times personality is found in an essay in Neyrey’s (ed.) book ‘The social world of Luke-Acts’. The essay I recommend is about the dyadic personality of the middle east, as we call it. It puts in perspective most things NT about which ‘we’ fail to have a clue here in the 21st century. I would recommend many essays therein for your ongoing work at ECC. Excellent points here – sounds like a wonderful book! 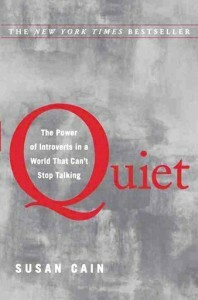 As an introvert, I am so reading this book so I can stop feeling like a fish out of water! (Or if I still feel like a fish out of water, at least I’ll understand why. I hope.) Thank you for introducing me to this book! When wanting to visit a congregation for the 1st time and calling for their Sunday AM worship times, I always like to inquire which entrance door they have for us introverts to enter. It’s difficult to invade a new building without being assaulted by the extroverts hawking the doors… Anyone else notice something similar? I’ve been thinking about this recently in terms of robust public spaces – a typical feature in traditionally-built cities and neighborhoods – and the increasing privitization of spaces in our cities. For instance, in a lively public place, all sorts of people can gather for any number of reasons, and engage with others on terms with which we’re comfortable; at the same time, actual relationships can form quite naturally. Introverted folks can have solitude but at the same time, by their presence in a public space, contribute to the whole, and form relationships at a comfortable pace. Extroverted folks may initiate more conversations and use the space differently, but again, contributing to the good of the whole.